﻿How does Edith Wharton present New York society in the first chapter of the age of innocence? 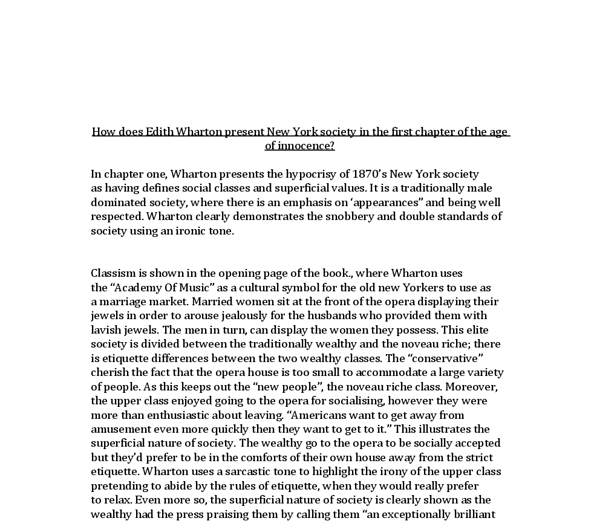 In chapter one, Wharton presents the hypocrisy of 1870?s New York society as having defines social classes and superficial values. It is a traditionally male dominated society, where there is an emphasis on ?appearances? and being well respected. Wharton clearly demonstrates the snobbery and double standards of society using an ironic tone. Classism is shown in the opening page of the book., where Wharton uses the ?Academy Of Music? as a cultural symbol for the old new Yorkers to use as a marriage market. Married women sit at the front of the opera displaying their jewels in order to arouse jealously for the husbands who provided them with lavish jewels. The men in turn, can display the women they possess. This elite society is divided between the traditionally wealthy and the noveau riche; there is etiquette differences between the two wealthy classes. ...read more. German story in which the successful but dissatisfied scholar make =s a deal with the devil, exchanging his soul and moral integrity for unlimited knowledge and worldly pleasures. Its ironic that the audience are watching the opera as Faust?s character similarly resembles the character of Newlands Archer. Newland Archer is Edith Wharton?s protagonist of the novel. The style, in which Wharton writes in, is in first person. Therefore, everything that the reader observes is through the eyes of Newland and what he perceives and understands it to be. By doing so, Wharton was able to make the reader see characters through someone else. This causes judgments to be formed, and a lack of knowledge to be created. ? 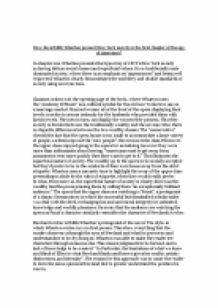 In Particular, the limitations of what we know and think of Ellen to what Newland thinks and knows gives her reality, artistic distinctions, and intensity?. The reason for this approach was to cause the reader to form the same opinions Newland did, to greater understand the position he was in. ...read more. Wharton uses her personality to reflect the importance of arrearance. Women were considered to be mother?s housekeepers and provide continuity. They were never regarded as being equals but just a ?product of the system.? Ellen Olenska?s is also created for appearance. Wharton created her character to be the sinful one. Ellen?s appearance was against the puritanical beliefs as she left her husband and supposedly had affairs whilst in Europe, and therefore is regarded as the ?black sheep? in the family. Women were always to be viewed as dutiful and loyal; therefore Ellen is seen in a scandalous way. Wharton uses the title? The Age Of Innocence?, to portray an iron statement as the reader is forced repeatedly to question how innocent of a time this is and if innocence is merely and appearance than reality. Although the society in ?The Age Of Innocence? is highly organised nuanced, it is merely that way so that indiscretions and actions that are anything but innocent can be kept hidden under the veneer of society. ...read more. eaten The story has a chronological flow as he as we only learn of events as and when they happen means a simple structure to the story. The style is formal towards the reader 'After a while Conradin's absorption in the tool-shed began to attract the notice of his guardian'. She is writing this account well after the events after all, meaning that her own views of events and time are distorted. There is a vagueness and ambiguity to the whole account and of course her personal feelings could have coloured her view of actual events; it is incredibly difficult to remember something so long after with total recall. She also criticised herself: 'I myself will be my own accuser.' This development from Cresseid makes her worthy of not so much sympathy but respect. Madame Bovary's development happens in a moment, which makes it more like an epiphany, thus lacking the cognitively prolonged nature of Cresseid's development. William Bradford was a Puritan leader who later became the governor of Plymouth Colony. His narrative described the Puritans' arrival to the New World. He focused on the relationship the Puritans had with God. He mentioned many signs of God's providence. The first act of providence was on the seaman. How does Auden portray his grief and loss in Funeral Blues? It is also a mark of respect. The sentence types that Auden uses are imperatives, these sentence types are orders. "Stop all the clocks" "cut off the telephone" "Prevent the dog from barking" "silence the piano" "Bring out the coffin" These sentence's cause the reader to stop what they are doing to listen to what the poet has to say. As the elder son of the family becomes physically intimate with Moll, she starts to become emotionally very intimate to him. She starts to believe that she could be a wife someday in that house. However, soon she turns wrong and learns the about the harshness male dominance.